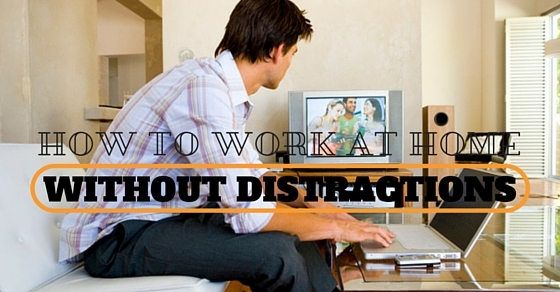 How to Focus on Work at Home without Getting Distracted? According to a study started by U.S Census, about 6 million American people work from their homes. If you are hoping to become one of them, then it is important to know its pros and cons. People who have been working at home for years have often complained about how hard it is for them to have an uninterrupted conference with clients and how it stops them from becoming their best. If you really want to excel and do your best despite working at home, then give this post a read. In today’s article we are going to share with you some basic productivity tips that can help you work at home without getting distracted. When you are working in a busy household, it comes very easy for kids to pile all their homework on your desk or play with you and around you. In that way it becomes quite a daunting task to create an atmosphere that is professional. If your home is big and spacious enough, you can establish it as an area where you can use your computer, speak over the phone and keep all important stuff and documents prepared. Keep your doors locked when you are working and have an open conversation with your family regarding working hours. In case you have any further questions, you could speak to someone who can help you with stuff like these. The second thing you must do is get a proper working schedule fixed. It is often easy to get sucked into the whole process of work. You will have to invest a lot of time in it and stay away from house chores unless your working hours have come to an end for the day. But the whole reality is that you have to make that happen. Something that can really help you in cases like these and boost your management skills is having a proper schedule that works. Not everyone has been hardwired that way. You have to be very honest before you take any serious step. You should always set your priorities in your office and make sure to do that even more when you are working from home. When your boss has been checking on your colleagues and expecting them to come up with new ideas, you can pitch some if you have a to do list from beforehand. It will help you staying focused at work and keep away from feeling overwhelmed. Therefore, simply jot down whatever that needs to be done on a working day and then number every single item. When the day has been completed, you can transfer those things that you haven’t done to the next list to make sure things don’t slip out. You should become active on groups such as LinkedIn where you can relate to some work, employers, alma mater as well as past employers or others who can follow your interests and catch up with you. It will help you stay in touch with people, comment on their posts and add at least two of their cents. It will also display your expertise and give you a proper feeling of becoming a community. Plus it is quite smart as you are expected to have new connections that you can link with. When you have started to work things out for yourself, you need to have an aggressive look when it comes to savings. If you happen to be someone who has been working at home, it will be tough to get raises or get promoted. You have to make it up and at least put 401 k or even a similar employer sponsored saving plan per year. All of this really matters when you are working from home and trying to plan things out. Help is not always the solution to the problem. You need to be able to do things on your own. If there is an error or maybe a technical glitch that your computer sees, you will end up looking for help and not find it for hours. So the smart thing to do is become as tech savy as you possibly can. If you get a computer freeze, you can cut that thing off at the pass by getting a computer class at your community college or if you are using MAC, then look for it inside your neighbourhood. We have two different browsers on your computer. One that is used for work and the other one which is used for casual surfing. The casual surfing browser is full of distractions because you will get plenty of emails, messages, bookmarks and what not. When you have the time for it, you should use the surfing browse, check the mails and your favourite sites to stay connected with them. On the other hand, the work browser is almost bare. You have to use job related bookmarks and the apps as well as extensions that let you stay productive. The result will help you access the net without having to face any distractions. When you are working at your place, your job will become far more stressful. So it is important to get organized as quickly as possible so that you can balance your work and home life. You have to be able to handle the cramped schedule that doesn’t disrupt or ruin your workflow. This also means that you will have to do everything that you can to organize and work your home office. Getting organized matters a lot nowadays! You have to be less stressed and work throughout the day like a pro. It will allow you to keep reminders, pictures and notes in mind when you are away from the desk as well. It is not always that easy to demarcate your home life from the work life when the computer happens to be just a few feet away from you. The best way to deal with that is have a work burnout which is to plan the whole schedule. Even though it is impossible to ignore the job after a few hours, you may work as a freelancer and meet deadlines. No matter what, you always need to set priorities. Have a 9-5 working hour plan and track those hours as well. Now this is going to sound funny but when you eat on your desk, you get to overeat and get distracted. Also you don’t tend to finish your meals faster. So if you want to be able to do that, you need to start eating inside the kitchen. When you are working or are at your desk, you must keep a bottle of water near you and nothing else. Also once you have taken a proper break, you may get back to the desk and go back to working as usual. Also remember to invest in some good quality headphones. It will control all disruptions when you are working. You won’t have to worry about what is going on at home and get all frustrated about it. Instead you will have time for yourself and work without any stress or hassle. Most people who work at home have used headphones and have often praised its worth. We bet it will work wonderfully for you as well. If you are having a bowl of oatmeal, you have to do a lot more than kick start the metabolism. For that we would suggest you to eat a good and healthy breakfast that can boost concentration and help you to pay attention. Eating a protein filled breakfast such as eggs, bacon and green tea can really keep you active and charged. Secondly, scientists have recently discovered that meditation can help you boost brain functions that are linked to the brain directly. It will help you shut down everything and get things done much faster regardless of whether you are working at home or elsewhere. Third, you should not be online when you are working. Most surveys have found out and suggested that around 60% of the distractions that people have from social networks and cell phones is because of this one important reason. You should put your phone on silent and check your mails once in every few hours. Limit the amount of time you spend on social media as well. Work for two hours and then take a 15 minutes break. If you don’t want to do that, you could work for 3 – 4 hours straight and then take a lunch break for 30 minutes. Taking breaks are very important when you are working. Bursts of hard work that are short followed by taking quick breaks will become more beneficial when you start looking for results. You will be surprised seeing what you have covered throughout the day. Also remember to reward yourself for the hard work you have done. If you have just completed a tough assignment or completed something that was long due, treat yourself with some delicious food at the end of the day. Have some frozen yoghurt topped with fresh fruit and chocolates or maybe go for a cookie. It will make you feel good. Finally, remember to boost your caffeine intake. Drink 3 – 4 cups of black coffee per day. Don’t add any sugar to it. When you have something tasteless, it makes you more alert. Also another smart thing to do is workout. You should spend 30 to 45 minutes on cardio every day. Before we bring the post to a close, here are a few home office ideas that can really work. Read them all below. A room with a proper view is perfect for a home office idea. There is literally no reason for sunlight and that it could cramp your style of decoration. You should set your chair and desk in front of the window and also have an empty corner in your home with a proper and tall bookcase. Keep your furniture in sync and keep all the existing pieces inside so that it blends perfectly. No matter what you are thinking, we have to admit that a proper and traditional desk will not help you become productive one single bit. Not only does it act as an armoire but also gives you a heft cabin for storage where you can keep silverware, stemware and other items. Double duty therefore is a priceless idea and can help you work overtime in a desk too. Even though working at home also comes with a few advantages, it can be quite a task to handle all the cons that come along with it. When you test and see what can help you to stay focused, you will have to be able to turn your home gig into a career that is fruitful and viable. You should be able to handle both the personal as well as professional world like a pro. On that note, good luck and here’s hoping that by using these tips you will be able to work at home like a professional.